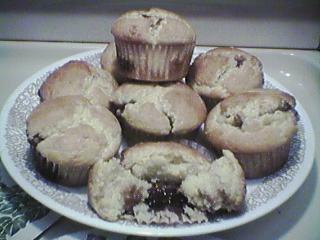 Preheat the oven to 375º F and grease 12 muffin cups (or use papers). Stir together all the dry ingredients in a large bowl. In a medium bowl, melt the butter and whisk the eggs, extracts, and sour cream into it. Add it to the dry mix and mix until even. Fill all the muffin cups about a third of the way up, then drop one heaping teaspoon of your jelly filler onto each. Cover with the remaining batter, filling to the rim. Bake 20-25 minutes. Cool in the pan on a wire rack for 5 minutes, then unmold and cool.